This is a sponsored post written by me on behalf of Rice Krispies®. As always, all opinions are my own. Every now and then, you come across a classic recipe with a new spin that is worth noticing. When I came across Tracy’s recipe for chocolate bark with Rice Krispies® stirred in, I stopped in my tracks. Why had I never seen this before? And just as I expected, it was incredible. It’s definitely one of those recipes that sounds exactly as good as it tastes. It’s almost as if the world no longer has a need for regular plain chocolate bark anymore! 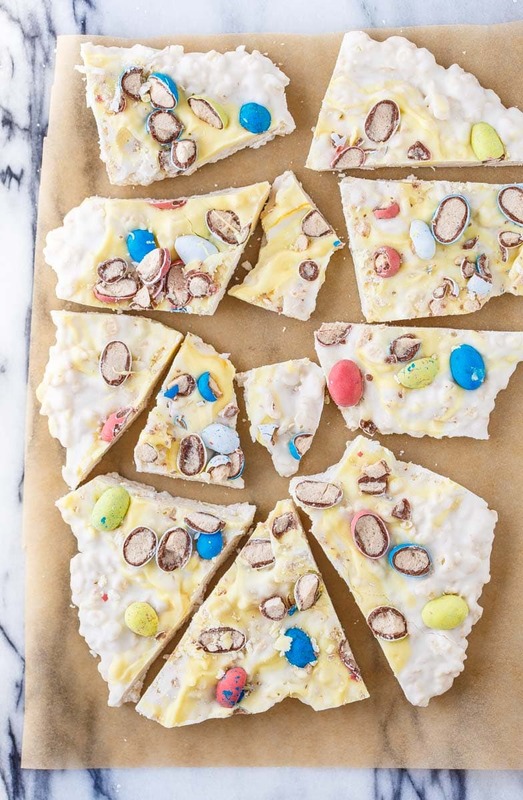 This white chocolate bark is rich and creamy, punctuated with crispy little bits. It just doesn’t get much better. It’s crave-able and addicting in the best possible way. I mean, honestly, there’s hardly anything that isn’t better with little crispy bits of puffy rice cereal. Me and Snap, Crackle, and Pop are the best of buddies. You could say I have a soft spot for white chocolate and Rice Krispies®, because Dessert for Two has a recipe for white chocolate toffee Rice Krispies® treats that my Mom makes for all the men as they’re packing the cars to head to Nascar for the weekend (I wish I was making that sentence up). 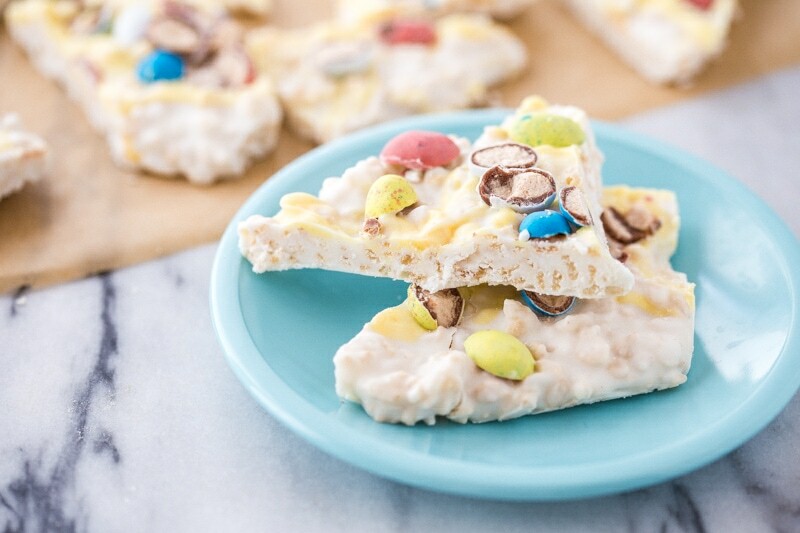 I made this crispy Easter bark as an easy way to spread Easter cheer to my neighbors. I have a neighbor who’s gluten free and one with a little boy who loves Easter candy. So, it was perfect! It was a big hit, and I can say that the entire block loved it! Even my husband was happy to see his favorite Easter candy (robin eggs) in the mix. That said, you can use any type of Easter candy you love. I think even tiny jelly beans would be good because the bark is light and crispy and jelly beans would be a chewy, fruity note. If the Easter bunny hasn’t visited your house and left candy for you yet, you could also use sprinkles. Even though this recipe is so dang simple, I took step-by-step photos for you. We’re not doing much more than melting chocolate, stirring in Rice Krispies®, and then adding crushed candy to the top, but it helps to see it all come together. The one thing I will emphasize about this recipe is that you need to be ready to go in advance. This means gather everything and chop in advance. It makes the assembly so much easier! 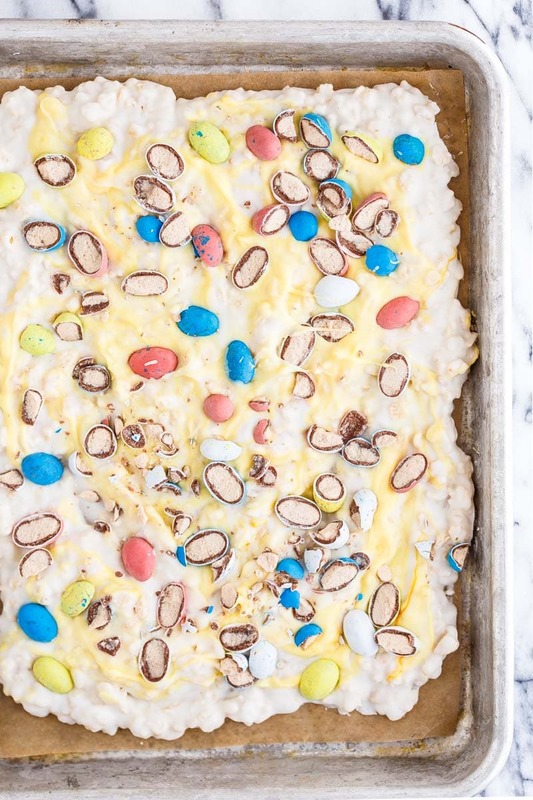 Gather your ingredients: white chocolate bark, Rice Krispies®, and Easter candy. The yellow food coloring is optional, and I’ll show you how to swirl it in, if you want to use it I should tell you that I used way more than 1 cup of Rice Krispies®. Once I stirred them in and tasted, I added another 1/2 cup more because I just love the crunch! 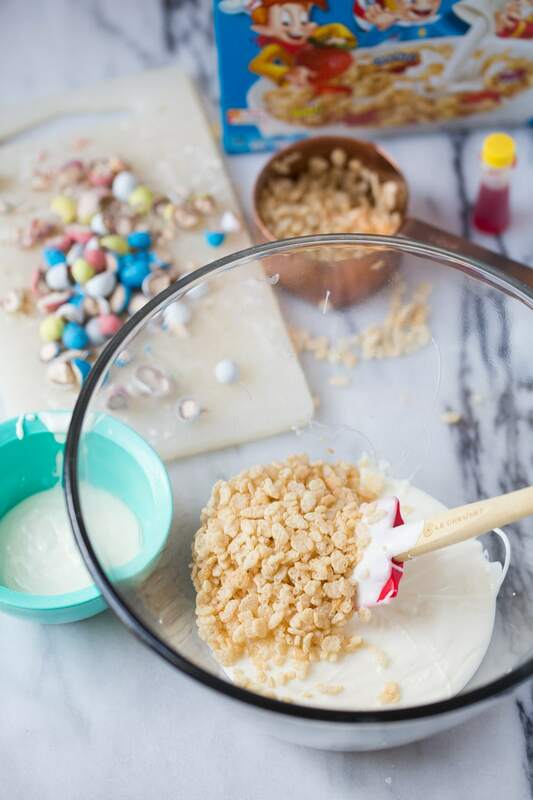 So, gather 1 pound of white chocolate bark, 1 1/2 cups of Rice Krispies®, and a chopped 1/4 cup of your favorite Easter candy. And grab a bottle of food coloring, if you wish. 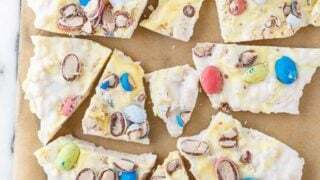 Melt the white chocolate bark in the microwave according to package instructions. Stir very well to ensure the chocolate is all the way melted. This is the optional part: you can pull out about 1/2 cup of melted white chocolate and stir in any food coloring. Set the colored chocolate aside. Next, stir in 1 1/2 cups of Rice Krispies®. 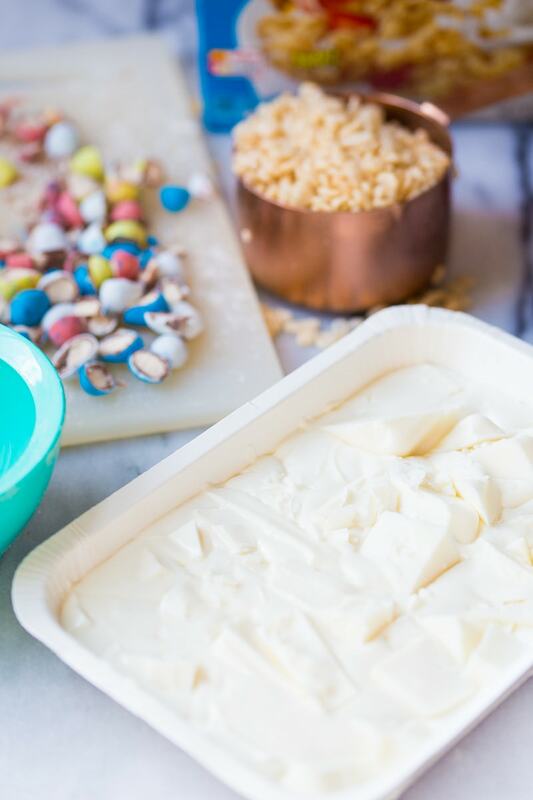 Spread the mixture on a baking sheet lined with parchment paper, and swirl in the colored white chocolate. Sprinkle the chopped candy on top. Let cool for about 30 minutes, break into pieces, and share the love! And tell me you’ll never make chocolate bark without Rice Krispies® ever again, ok? Line a quarter sheet pan (measures 9x13) with parchment paper and set aside. Melt the white chocolate according to package directions. Stir to ensure it is evenly melted. Optional: Remove a 1/2 cup of the melted chocolate, and stir in the yellow food coloring. Stir the rice krispies cereal into the white chocolate; stir very well to combine. Spread the chocolate bark on the prepared baking sheet. Swirl the yellow chocolate bark on top (if using). Sprinkle chopped candy on top. Let set for about 30 minutes before breaking into pieces. 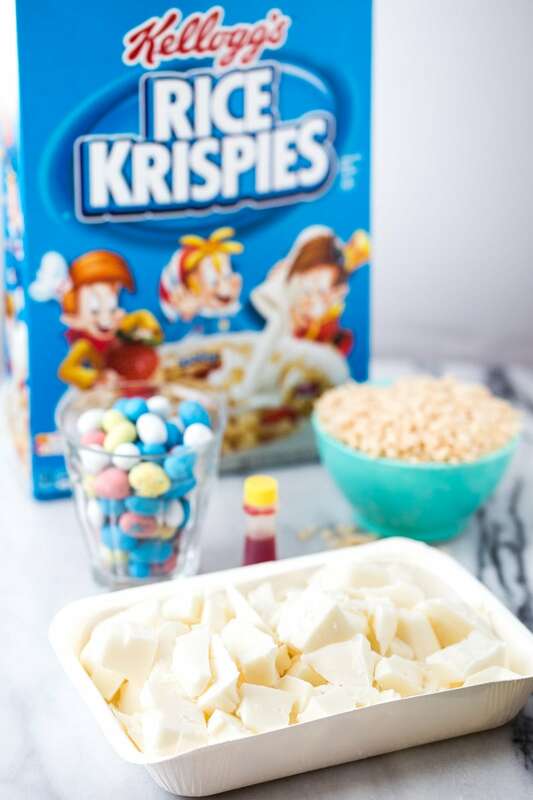 For more fun and delicious Rice Krispies® treat recipes, be sure to check them out on their Facebook, Twitter and Pinterest pages! 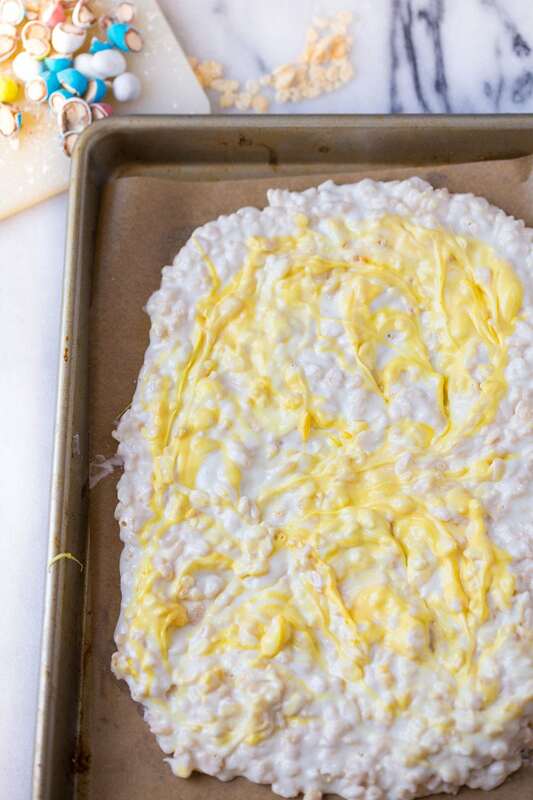 love the idea of rice crispy with white chocolate. i dont celebrate easter but i am always up for candy. I love this idea! I’m typically not a big fan of white chocolate, but a good friend introduced me to White Chocolate Holiday Bark several years ago and now it’s a tradition in my house. It’s similar to this – it’s mostly white chocolate and Rice Krispies, with the addition of toasted coconut, toasted almond slivers, and chopped dried cranberries. I love the stuff so I’m sure I’ll like this too! It’s so pretty and looks incredibly easy to make. Happy Easter! Looks delicious! I got this idea from my sister in law: take smores dip recipe and instead of marshmallows, top with easter peeps. It’s making the rounds on pinterest. It’s really cute. That sounds incredible! I wish I was credited with recipe inspiration on that viral pin! Oh well! Yum!Yum!Yum! Filing this under “must make”! Thanks! I like the idea to add Rice Krispies cereal. It will make the bark crunchy.